STS-129’s crew have worked through the primary Flight Day 2 task of inspecting Atlantis’ Thermal Protection System via the Orbiter Boom Sensor System (OBSS), while the Mission Management Team (MMT) review ascent data and imagery of STS-129’s External Tank (ET-133). Post Sep ET Umbilical Well photography shows what appears to be one of the cleanest tanks on record, although some intertank foam loss is noted on the backside of the tank. Flight Day 1 activities rounded up the crew’s day after launch, with the opening of the Payload Bay Doors and Ku-band antenna deployment. Remote Manipulator System (RMS) activation and Umbilical Well and Handheld External Tank photo and TV downlinks followed, prior to crew sleep. Some of the crew went to bed over an hour later than scheduled, likely due to the excitement of the super launch they had just been involved with. “The STS-129 mission was launched at 320/19:28:09.985 GMT. 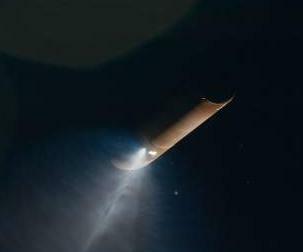 A nominal Orbital Maneuvering System (OMS) assist maneuver was performed following SRB separation. Ignition occurred at 320/19:30:24.2 GMT [00/00:02:14.3 Mission Elapsed Time (MET)], and the maneuver was 84.40 sec in duration. MECO occurred at 320/19:36:34 GMT (00/00:08:24.0 MET). 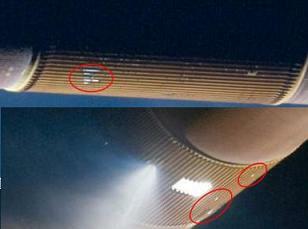 The ET separated from the Orbiter at 320/19:35:56 GMT (00/00:08:38..2 MET),” noted the MER manager’s report (L2). “A nominal OMS-2 maneuver was performed at 320/20:06:25.2 GMT (00/00:38:16.3 MET). The maneuver was 63.8 sec in duration with a differential velocity of 96.9 ft/sec. The achieved orbit was 85.2 by 124.7 nmi. An expanded systems overview of Atlantis’ performance during ascent will be provided in an upcoming article, based on information collated in the expansive Consolidated Ascent Report (L2). Following wake up on Flight Day 2, the crew pressed forward with the TPS and OMS pod survey via OBSS. Other tasks for Tuesday involve EMU checkout and Centerline camera installation, followed by ODS (Orbiter Docking System) ring extension and Rendezvous tools checkout. The RMS will also be positioned to grapple ELC-1 (ExPRESS Logistics Carrier) in Payload Bay. Atlantis remains on the timeline, ahead of Flight Day 3’s rendezvous and docking with the International Space Station (ISS), with only three “funnies” (minor issues) reported by the Mission Evaluation Room (MER). “Funnies: MADS PCM BITE Failure – INCO (Instrumentation and Communications Officer) reported a PCM BITE failure post wide band shutdown. The team is still looking at the data and will present a status at tomorrow’s OPO (Orbiter Project Office) tag,” noted Tuesday’s NTD status via the MER (L2). 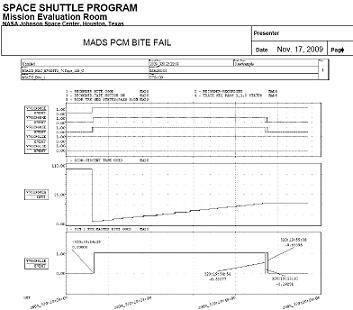 The MMT have already been handed a presentation on the MADS (Modular Auxiliary Data System) PCM (Pulse Code Modulation) BITE (Built In Test Equipment) failure, which holds no mission impact due to 3/3 criticality. MADS is an onboard instrumentation system measures and records selected pressure, temperature, strain, vibration and event data to support payloads and experiments and to determine orbiter environments during flight. It supplements existing orbiter operational instrumentation by conditioning, digitizing and storing data from selected sensors and experiments. The MADS collects detailed data during ascent, orbit and entry to define vehicle response to flight environments. It permits correlation of data from one flight to another and enables comparison of flight data from one orbiter to another orbiter. MADS records approximately 246 measurements from the orbiter airframe, skin and orbital maneuvering system/reaction control system left-hand pod and works on several “modes” – one of which is PCM mode. “Description of Anomaly: MADS PCM BITE indicated fail at 320:19:54:54 for 16 seconds and then continuously from 320:19:55:38. MADS PCM BITE normally indicates fail when MADS PCM power is removed. However the command to remove MADS PCM power was not sent until 320:19:58:33,” noted the MMT presentation, available on L2. “This was after SSR1 stopped recording MADS data at 320:19:53:34 so MADS PCM ascent data was not affected. Consequences of Anomaly: If the problem is a failure of the MADS PCM, PCM entry data may be lost. MADS PCM is criticality 3/3. Loss of MADS data will not affect crew or vehicle safety or mission success. “Recommendations/Action Plan: No workarounds exist to recover data. When MADS PCM is powered on for entry, a BITE fail indication could occur. This will result in possible loss of some or all MADS PCM entry data. MADS Recorder dump may provide additional information for troubleshooting postflight. Though prior to launch, the “noise” issue with Fuel Cell 2’s H2 pump motor has also been documented on the MER list. The FC has been performing well since – and given the condition has been seen on previous flights, it will be documented as an explained condition. “Fuel Cell 2 FCP H2 Pump Motor Status, was erratic pre-launch. Most of the bit flips were only 1 flip with an occasional 2-3 bit-flip toggles. Based on a pre-launch PRT discussion, it was decided to leave the measurement in the Ground Launch Sequencer with no value changes,” added the MER. The main focus of engineers on the ground over the coming days will be the evaluation of ascent and on orbit imagery to ensure Atlantis is safe for re-entry at the end of this month. The DAT (Damage Assessment Team) have started to review ascent imagery from ground based cameras and radar facilities, ahead of their opening report to the MMT on Flight Day 4. Handheld video and footage from the new minicam on the flight deck have already been downlinked to the ground, as have the set of ET Umbilical Well images of the tank just after separation. 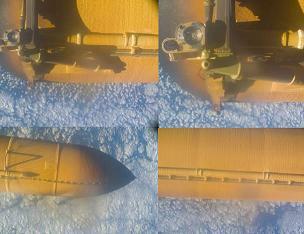 These photographs are utilized to reveal the health of the tank’s TPS foam after ascent, with any liberations easily visible – allowing for mass measurements, composition and origin of liberation to be cross referenced with video footage of foam loss and potential impacts on the orbiter. The initial estimate of three debris events observed on the ET cam during ascent is unlikely to rise, with an amazingly clean tank that only appears to have two very minor areas of foam loss – as per set of hi res ET Umbilical Well photographs, acquired on Tuesday morning by L2. These two areas are so minor, they might even be pre-flight areas of repair. The photographs taken by the ET Umbilical Well’s flash/camera system show all of the LO2 and LH2 Ice Frost Ramps (IFRs) to be intact, with no foam loss from the intertank or other critical areas. There appears to be a minor foam loss near the 17 inch feedline, and one under the left hand bipod strut, likely awarding ET-133 with the honor of being one of the cleanest tanks since Return To Flight. No other areas of foam loss are obvious – at least to the untrained eye – which once again boosts the continuous efforts to mitigate foam liberations by engineers within the Space Shuttle Program (SSP), and at the Michoud Assembly Facility (MAF) in New Orleans. UPDATE: Further images from the handheld camera do show what appears to be foam loss events on the backside of the tank – although such liberations would not hold any impact threat to the orbiter. Foam loss threats from an orbiter impact standpoint mainly originate come from the top side – in line with the orbiter during ascent. Additional ascent footage will be taken from recorders on the two Solid Rocket Boosters (SRBs), once they have been towed back to port by the retrieval ships Liberty and Freedom. The boosters are expected to be ready to pull out of the water on Thursday. Washdown and safing of Pad 39A is also in work, with some reports of damage to the flame pit being noted – although full evaluations can only take place when the pad has been fully cleared for engineerings to enter.